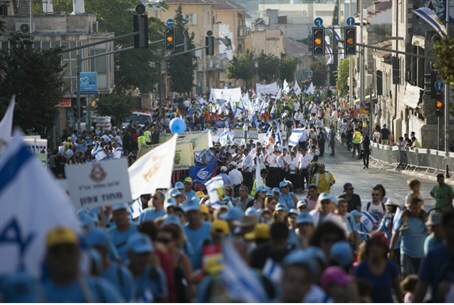 Thousands from around the world march in Jerusalem to express support for the State of Israel. Thousands of people from around the world marched in Jerusalem on Thursday to express support for the State of Israel. The Jerusalem March, which takes place during Sukkot each year, also included marching bands, IDF soldiers, street artists, dance groups and more. Arutz Sheva brings you a video and photos from the event. Click here for additional photos from the march and see flags from other countries that were waved, alongside the Israeli flag, during the march. Video by Natan Epstein and Yaakov Lepon, "King David Studios"